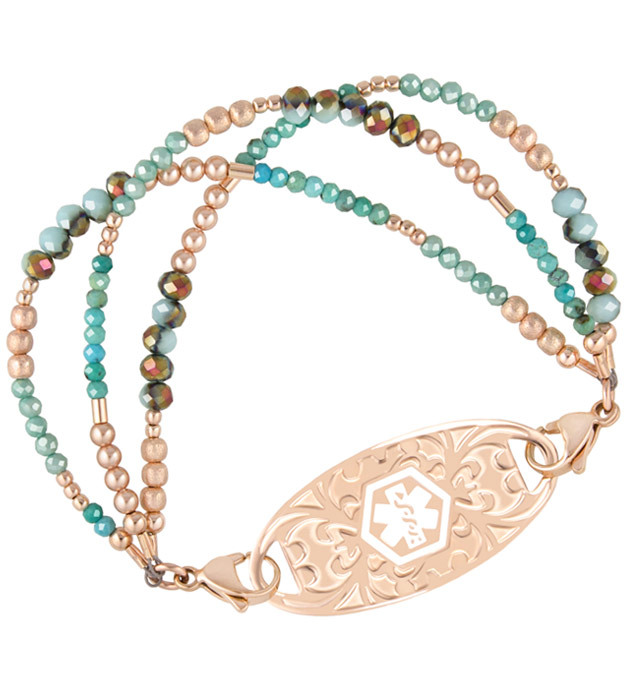 Inspired by the exquisite turquoise jewelry and beautiful sands of the American Southwest, our Sedona Medical ID Bracelet features a gorgeous blend of rose gold, turquoise, and faceted crystals. Meticulously hand-crafted by our Kansas City artisans, this med alert bracelet boasts three complementary yet unique beaded strands. Finished off with rose gold tone lobster clasps for easy interchangeability, this earth-tone med ID bracelet is anything but neutral. Interchangeable medical ID bracelets feature a lobster clasp at either end of the bracelet strand, allowing you to move your medical ID tag from one bracelet to the next with ease. This way, you can always have more than one medical alert bracelet without needing multiple med ID tags. When you order your backup med ID strand, simply let us know you already have a Lauren’s Hope medical ID tag, so you only ever order exactly what you need. Not sure which ID is right for you? In short, they all are! Every med works for every condition because we offer custom engraving. Simply choose the design you like, pick out an ID tag, and list your engraving to turn any style into the right medical alert bracelet just for you. Whether you or your loved ones wear medical alert bracelets for a history of epilepsy, lupus, hypothyroidism, Alzheimer’s, vision impairment, or any other medical condition or treatment consideration, custom engraving allows you to choose the look you want so you can stay safe in style.